Association SOURCE is sent directly to the executives and meeting planners who make the decisions in Florida’s associations. These executives, their staffs, and their association members represent millions of dollars in sales opportunities. 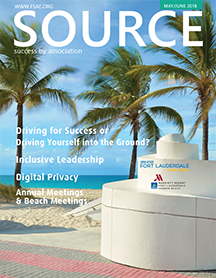 SOURCE is the top source for information on Florida association business management and resources. With over 1,100 members in the State of Florida, including those who manage trade and professional associations, individual membership societies, charitable organizations and other not-for-profit organizations, the Florida Society of Association Executives (FSAE) is the recognized primary resource for information on associations. FSAE represents associations whose combined membership exceeds 1.5 million Floridians. Florida-based associations are responsible for $1.53 Billion in total expenditures. Florida-based meeting attendees number over 4,100,000. Hotel expenditures by Florida-based associations exceed $1.65 Billion. The total employment impact of Florida-based associations is over 88,000 jobs. [email protected] or by phone at 850-926-3318.